We breathe in a world where the air is filled with pollutants. We function in a world where artificiality reigns supreme, as the utmost importance is placed upon lightning-fast technology and overwhelming, instantaneous communication via electronic devices. We exist in a world that favors productivity over pure joy—thereby ensuring the unfortunate continuance of sullen, burned-out, passionless humans. All of these things have further disconnected us from our inner nature—our health and our humanness, if you will—as well as the outer nature (a.k.a. Mother Nature). It may sound counterintuitive, but the busier you are, the more stressed and engaged you are in the mechanical, computerized landscape, the more important it is for you to take a few minutes and recalibrate yourself, to get back to your true nature. One of the best ways to do this is to reconnect back with the organic, ecological world, and allow nature to nurture you. Humans have a long and complicated history with the natural world. In ancient times we boasted a symbiotic, healthy partnership with the Earth and all living things. Unfortunately, later we became fearful and distrustful of the natural world and blamed it for much of our problems. Nowadays, you hear about how detached humans are from the environment, and the term “nature deficit disorder” has entered into our language, describing the increasing withdrawal of people from the outdoors. Some experts even contend that as humans distance themselves from nature, it will increasingly result in health problems (one such issue already widespread is the lack of sun exposure, resulting in a deficiency of vitamin D and hindering the building of strong bones). Have you ever had to make a major, yet tough decision and found yourself walking around outside in nature, with the intention set to “clear your head?” Or maybe you were feeling overwhelmed and stressed out from as issue at work and decided to take a brisk stroll around the neighborhood and wander through your garden. Although it may have been an unconscious move, somehow reconnecting with the outer world helped to reconnect you with your inner self. Somehow just by breathing in a bit of fresh air and surrounding yourself with the natural world, you had better clarity of your situation, helping you feel more at ease or move forward to make an important decision. This is no coincidence. Natural places seem to have a healing, consciousness-opening affect on humans. Some people even note that their creativity is heightened and flows more freely when they spend time in natural surroundings. How might we once again restore our health and humanness? Communing with nature as a form of environmental healing comes highly recommended. It can act as a “reset” button for us. So go ahead and breathe in that fresh air, enjoy your time at the park, and heck, give that tree a big bear hug! When you reconnect with the essence of nature, you are in fact connecting back to a part of yourself. There is a global support system we can access from our fingertips and no; you don’t need an Internet connection to download it. It is an intricate, ecological matrix that exists all around us and binds all earthly beings together. 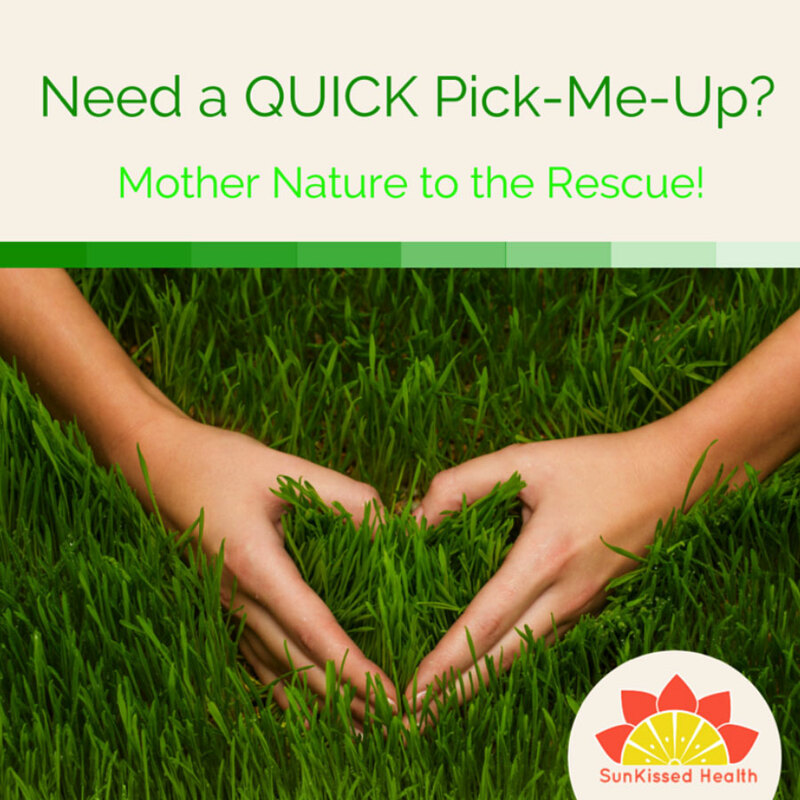 Be sure to use nature for a little pick-me-up every now and then. Buy yourself a plant or bouquet of flowers to sit on top of your desk or a nearby table. Sometimes just the sight of verdant color amidst the drabness of an office space can rejuvenate the senses and give you an energy boost to finish that spreadsheet or send a few more emails. Anoint yourself with the natural essences of the earth. Essential oils like lavender have a calming effect on your body’s nervous system and come in small bottles that you can easily store in a purse or drawer. You can apply lavender directly onto the skin at the pulse points (on the inner wrists or neck). Place a few drops of peppermint in the palm of your hand, rub both hands together and breathe in this invigorating scent (suggestion: keep your eyes closed, as it may cause irritation). It can literally “pep” you up and awaken your mind. Sip some tea. You don’t have to be British to make some time for tea. Brew some chamomile or kava kava for its calming effects. Green or yerba mate tea can be very energizing and lemon balm has been known to be quite uplifting. There are so many teas to choose from and most have a wide range of healing properties. If you can, open a window to circulate some fresh air into the room. You wouldn’t believe how stale (and full of toxins and allergens!) the air can get indoors, especially during the hot or cold months. Let the room have its turn to breathe! Hang pictures or paintings of beautiful, natural scenes up on the wall. Mere images can even evoke a sense of healing and relieve stress when you view them. Or, engage in some mental imagery and use your imagination to envision natural scenes like a serene ocean beach, a snow-tipped mountain, or a field overflowing with colorful flowers. Listening to guided visualizations of tranquil natural scenes has been proven to be an excellent stress reduction technique. How do you use nature for health and healing?